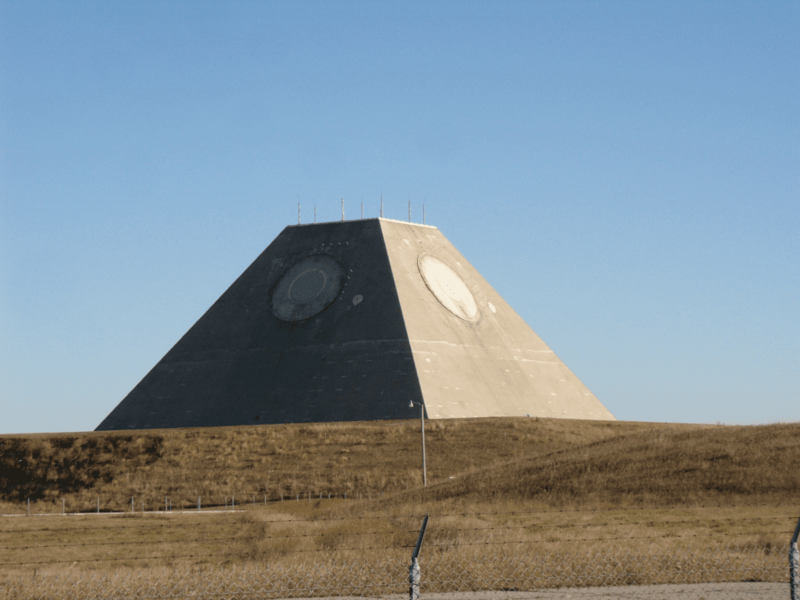 Did you know there is a pyramid in North Dakota? Standing silent and tall over the endless plains, with little more than a fence between it and the north pole, is a pyramid, looking like it belongs in the jungles of central America or the deserts of Egypt. But it’s an American made structure that may well have prevented a nuclear war between the old Soviet Union and the United States. This pyramid was conceived in the 1960’s. It was built at the orders of President Nixon, to house a very complex radar and missile defense system. The radar antenna was built in to the pyramid. Its shape allowed 360 degree surveillance of the northern skies. The system was designed to detect incoming missiles as they flew over the north pole, then plot an interception course for the 46 anti-ballistic missiles that were on site. These anti-ballistic missiles carried nuclear bombs that would be exploded in the path of the incoming Soviet missile. The launching pads for the missiles were all underground. Also underground was a huge complex of chambers for the people who operated the system and an immense room for the huge computer that oversaw it all. That computer had to identify the incoming target, plot the correct intercept course, then launch and control the anti-ballistic missile. That computer could probably be replaced by a couple of today’s cell phones. But it did the job. The system went operational in 1975. No one knows if it really would have protected us; it was only in operation for a few months. Some historians believe its mere existence frightened the soviets to the point that they made important concessions that eventually led to a strategic arms limitation treaty. Another factor, no doubt the Canadians didn’t much like that the US would be launching nuclear missiles to explode other nukes in Canadian airspace. The entire facility was very costly – some 6 billion dollars were spent to build the site. These were 1970 dollars, so it was a staggering investment. Was it worth it? It was the cold war, a time that is hard to remember now, so many years later. But the threat of nuclear war was a constant, nagging fear. If the mere existence of the facility prevented an attack, then yes, it was well worth it.